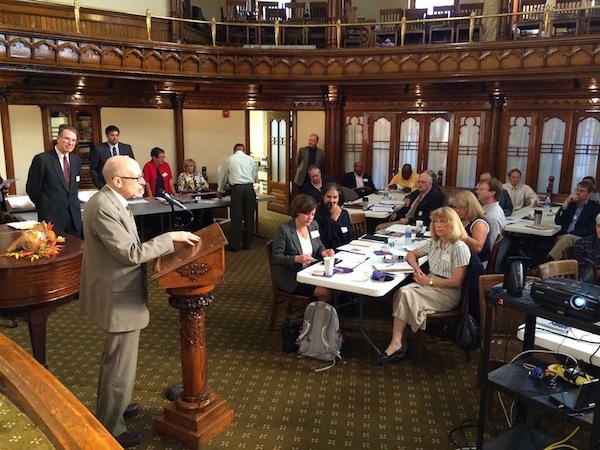 Forty-six people representing 24 congregations from around Allegheny County and one group from Fairmount, West Virginia attended our Technical Assistance Workshop on September 30 at historic Calvary United Methodist Church on Pittsburgh’s North Side. Many of these congregations were there to learn from their peers about applying for a grant, selecting a contractor, managing a project, and raising funds for their grant match. A roofer, masonry contractor, and a stained glass window expert discussed restoring those significant building elements. The attendees also received detailed advice about filling out a grant application for the 2015 grant cycle. So far this year, seven HRP grant awardees have completed work to preserve and maintain their buildings. Matching grant awards have helped to restore stained glass windows at All Saints Polish National Church in Carnegie, at Fairhaven United Methodist Church in Carrick, and at Sacred Heart Church in Shadyside. Jerusalem Baptist Church in the West End used their grant award to replace a very worn and rotted front door with a historically appropriate new one. The Islamic Center of Pittsburgh in Oakland replaced their entire flat roof, and Pittsburgh Mennonite Church in Swissvale pointed their bell tower. The Pittsburgh Northside Church of God in Manchester repaired windows and painted exterior trim. These matching grants, totaling $55,680, have leveraged $189,245 in restoration work. Other grant awardees are expecting to complete their projects by the end of the year. Any religious congregation in Allegheny County that owns an historic building that is more than 50 years old and is planning on undertaking critical exterior work in 2015 may apply to PHLF’s Historic Religious Properties Program. Applications for the 2015 grant cycle are due December 1, 2014. Please see our web-site, www.phlf.org., for information about the program and an application.